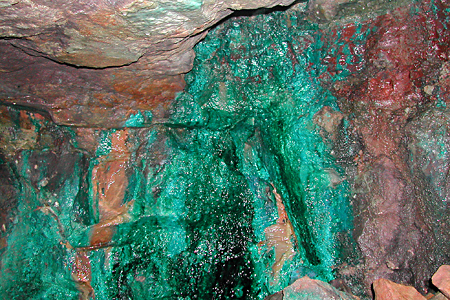 Malachite, Cu2CO3(OH)2 has been mined at Alderley Edge since the Bronze Age. It can be smelted to obtain copper metal, or used as a pigment. This 'green waterfall' is in Wood Mine. I'm very grateful to the Open University Geological Society and the Derbyshire Caving Club for their expert navigation through a maze of tunnels in the mine.